John picked up the breakfast bill, and Edgar recalls, "After he paid, he told me 'I'll give you my kidney.' I was shocked, hoping this was real." With living-donor kidney transplants becoming more common, the prospect of John being able to donate one of his kidneys to Edgar was not out of the realm of possibility. According to Martin Mai, M.D., medical director for the kidney and pancreas transplant programs at Mayo Clinic's Florida campus, living-donor transplants now account for one-third of the kidney transplants done each year in the United States. "Without this option, the wait for deceased-donor kidney transplant would be significantly longer," Dr. Mai says. "Living-donor kidneys have an added benefit in that they work longer than deceased-donor kidneys, meaning there is a decreased chance of a patient needing additional kidney transplants." Dr. Mai says that living-donor surgery has also increased with the development of laparoscopic removal of the kidney — a technique that makes recovery quicker for the kidney donor. At the end of their conversation in the restaurant, Edgar and John exchanged phone numbers. Over the next few months, they spoke regularly. After a call in January 2017, John knew his friend wasn't doing well. He began the process to see if he was a match for Edgar. A few weeks later, John got the news that he was an eligible donor. "I was overjoyed and thanking God for putting John in my life. I was ready to give up before meeting him," Edgar says of learning his new friend could donate a kidney to him. "My biggest push for giving Edgar a kidney was thinking, 'What if I don't need my two kidneys, and I die with both of them?' I have the opportunity to change someone's life," says John, who visited Valdosta to meet the pastor's family and congregation. He then came to Mayo Clinic's Florida campus in April for a week of testing. "I was concerned that my health might not be as good as I thought it was," John says. "It was incredible the time Mayo not only put in to clear me to donate but also to ensure I was healthy enough to give Edgar my kidney." John was approved to become a donor on May 6. The transplant surgery took place on May 17. 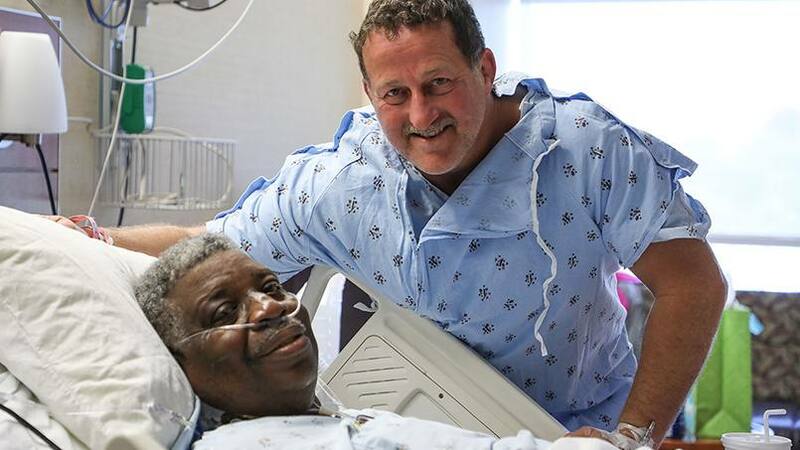 The day after the transplant, the two men had an opportunity to talk. "I got a little choked up," John says. "I elected to do this because it was the right thing to do. It felt really good to do this. I didn't know when I made the offer what a great person he really is." John says that since he donated his kidney, he's adopted a healthier diet. He quit drinking soda and walks about 10 miles a day. He's looking forward to getting back to the gym soon, too. The experience, John says, "makes you realize that you spend your whole youth chasing wealth, and then you chase your health. I don't want to do that." John adds that the men consider themselves family now. And each is looking forward to a brighter future. Edgar, of course, is beyond touched. "What John gave me is priceless. It's a lifeline," he says. "When you have dialysis, there are so many restrictions. I've always been mobile and active. To be able to go see people and talk to folks, that's just a blessing to me. Now I can spend more time with my grandchildren and my wife. I'm excited for the future." Learn more about kidney transplants. Explore Mayo Clinic's Transplant Center. Connect with others talking about Kidney Transplants and Living Donor Transplants on Mayo Clinic Connect.